To fix mistakes: You will probably still have some bleeding that you need to touch up. What works best with latex paint is a little bit of denatured alcohol and some cotton swabs. This will take off latex paint pretty well, especially if it hasn’t had too much time to dry. This does not work with oil based paint though. If the denatured alcohol doesn’t work, we used a light sanding pad to get into tiny nooks and crannies, especially the angled ones. If you take off stain from parts that are stained, you will need to re touch that area. We had a ton of this because of the oil-based paint and we had to contact the painters from our home build and find the exact stain they used. But it’s nice to have on hand because now we can match other wood projects we might want to stain to match later. Almost all our mistakes had to be sanding down and re-painting or stained. My husband wasn’t satisfied with my attempts to fix it so he took over this project, being the perfectionist he is. So I gladly let him do it, even though it literally took him the rest of the year to finish. And he still has one section to go through and who knows when he will get to that! That being said, I’m so glad we did it. I love the look of the tone-on-tone and it looks so nice with all our wainscoting. I can’t wait until we can finally rip out the carpet and put it beautiful wood treads. But that probably won’t happen for awhile. I have the same staircase and my balusters on the knee wall unscrew. On the flat (the landings) they do not. 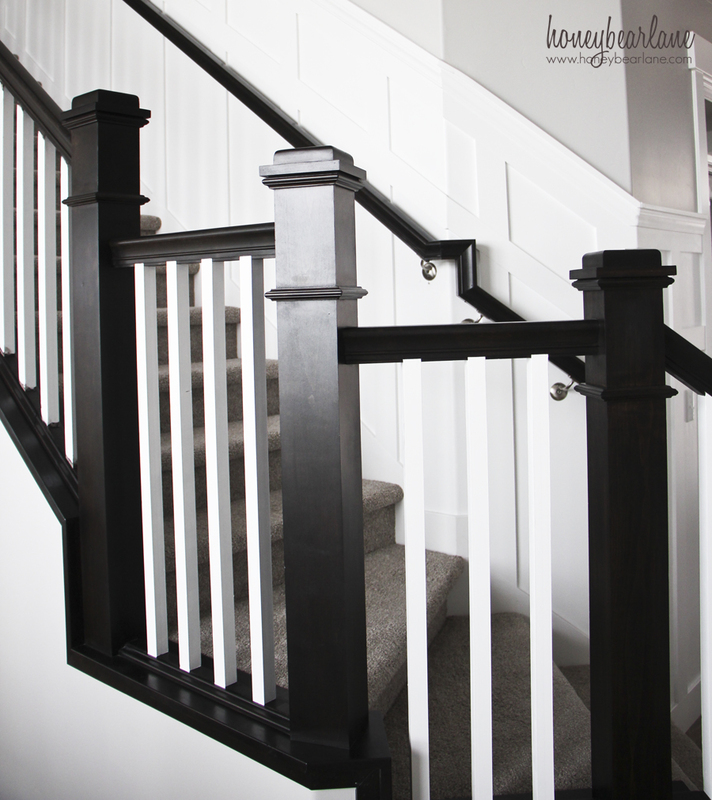 Would this project have been easier if you simply removed the knee wall balusters? Then you wouldn’t have needed to tape and the paint finish would be uniform all the way to the ends. Thinking about tackling this soon…. Or just replacing all of the wood with iron. Yes, if you can remove the balusters I would do that. Ours do not remove so we had to tape them. I swear I checked for typos and grammatical errors. Stupid iPad! That’s a lot of railings you painted–bravo! Great tips! I want to do my railings gray. What did you use, paint or stain? And what color? I’m embarking on the same adventure/project. Do you think the foam roller would work better than a brush since my balusters are the tapered kind round above with a small millwork ring then square at the bottom? Originally someone had painted water-based latex over stain which then raised the wood grain which does not look good. Its a mess! I’ve stripped and sanded a couple of the railings and not sure how to make the balusters look smooth. New ones would be better but a complete disassembly is out of the question at this time. Any suggestions would be greatly appreciated. And thank you in advance! I did use a foam roller at first but it leaked through the tape. The biggest key is to ensure a very tight seal with the tape! I feel like you have more control with the brush. I love the wainscot on the stairs wall. How far did you space rack slay and how high is it? They are spaced about 12″ apart and about 3.5′ high. Hi! I’m about to embark on this and am super nervous. A majority of the sanding is done… But choosing a paint color is stressful. I love the color you have for your railing, what is it? My color is actually just ultra white in satin! May i know what color.you use for hand rails? The dark stain was a custom stain by a company here in Utah, so I’m sorry but I don’t know! I’m about to undertake this in my 40yo home. Some genius repainted the balusters without prepping the surface so they peel if you look at the wrong! 😩 Also, we had the treads stripped and refinished with just poly, no stain, so they are white oak, handrails are walnut= very mismatched! I want to do balusters and rails in white. Plan is to sand back peeling paint and rough up the rest, prime it all, and double coat with semi-gloss white. This seems to have worked well on my fireplace mantle, but do I need to seal the railings with anything since they are high-traffic? If so, what? Good luck! That sounds like a big project. 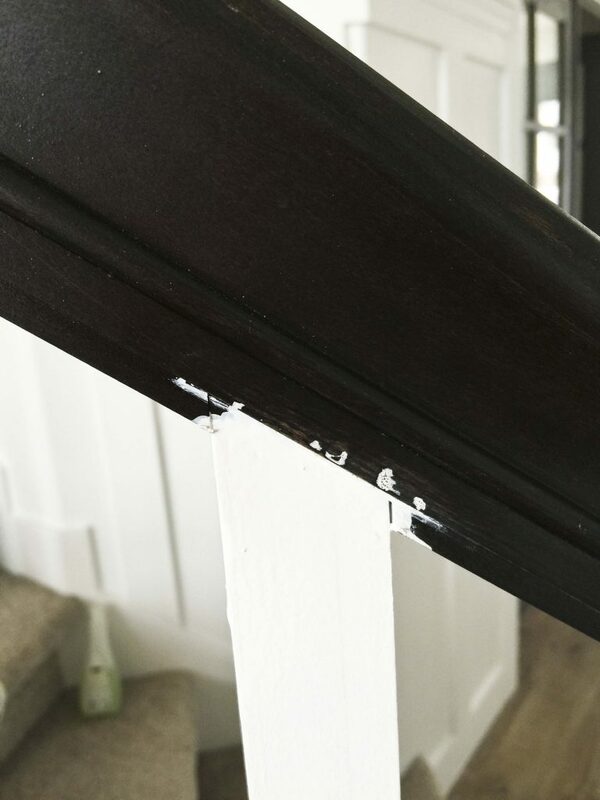 I would definitely seal the banister, it helps the paint job last a lot longer and if it gets something on it, like pen, you can clean it off without damaging the paint. You could try polycrylic, which is a water based sealer and doesn’t yellow as much as the polyurethane. Also see if you could find it in a wipe-on application because I think that might be easier. I’ve been on this journey for about 3 weeks. I did the lower part of my railings and banisters. I used general finishes java stain and it was a breeze! Only thing is that it takes 24 hours to dry. But the finish is beautiful and you can see the wood. The stain is dark but not black. After that I painted the spindles with a primer and then latex paint. It was a catastrophe…the paint bled on my perfect stain and I had to sand it down. TAPING IS KEY. I was using the blue edge lock tape and it was not working. After the fiasco I used frog tape and used a straight edge to seal it….MUCH BETTER. I’m almost done…it’s not for the faint hearted but I’m loving where I’m at…I need one more coat of paint and then fix the stain on the bottom and then seal everything. Oh man I’ve been there! You have to be SO tight with the tape. Good luck! I had my stairs go from oak to all white. Big mistake. Now I’m wanting to make the handrails the Java Gel and re paint the balusters white as it needs touch up. I’m wanting to do the bottom dark as well. My question is well I ever see the the wood grain if I just lightly sand it and use the gel on the handrails? I’m reading mixed reviews. I don’t have a ton of experience with gel stain. I would imagine the only way to really see the wood grain is if you sand off a fair amount of the paint, but also if you do that unevenly then it might look uneven through the gel stain. Sorry that’s not very helpful! account your blog posts. Any way I will be subscribing to your feeds and even I fulfillment you get admission to constantly fast.